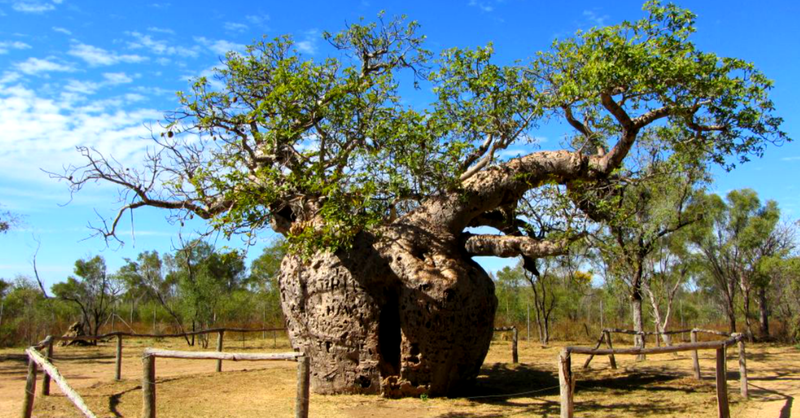 This boab in the Kimberly region of Western Australia is tied to Aboriginal mythology and a sad past. For the Aboriginal people Larrkardiy always had a special strength and power. The dreamtime stories tell that this power had made the trees so arrogant that at last God punished them for their impertinence by pulling them all up and sticking them back again, upside down, their roots left where there leaves should have been. Undaunted, the Larrkardiy continued to grow and the desert tribes learned to respect their power. When treated with respect the tree yielded many treasures in a land where every day was a struggle for survival. Water in times of drought, seed pods for carrying, bark for weaving and roots for eating. But, disrespect the Larrkardiy and you would face a terrible retribution. They would have to camp. The two Blackbirders couldn’t manage nine experienced aboriginal tribesmen at night in the open. They had taken their collection of prisoners, tied by their hands to each other down the track to Derby. Riding through the bush in their thick woollen jackets and trousers the Blackbirders looked ridiculously overdressed. Their red, burnt faces contrasted with the brown skin of their captives, dry as the land and as dusty. One of the Blackbirder’s dogs, a mangy mongrel half dingo and half everything else snapped at the prisoners heels or ran off into the bush to chase inquisitive goannas. The “Prison Tree” was a huge boab. In the flat lands it could be seen for miles. For the local tribes it had been a source of many legends. Then the white fellas came. No one knew who first thought of using it as a holding pen for prisoners, but, in the desert you had to make do. This Larrkardiy was known as the two sisters to the locals as it had grown like twins. Between was a cavity ten feet deep and about six feet high. “Get in there!” the Blackbirder shouted at the group of men looking about in uncertainty, not understanding. They had been walking for a two days, away from their tribes, away from familiar landscapes. Most of them couldn’t understand the English of their captors. “In there!! !” The redder faced Blackbirder pointed at the hole in the boab with his rifle. A shudder ran through the group. How could they fit? What would the Larrkardiy say. Surely it would not like it. The rifle went off and the bullet hit the boab which resounded like a drum. Water poured like blood from the bullet hole. The prisoners ran towards the dark cleft in the tree, terrified by the shot. One prisoner fell and was dragged along by the others. They clambered into the space oblivious to the webs of spiders and the stinging of ants. It was choking hot in the darkness and the smell of the sweating bodies grew unbearable, but the ones near the front told the others that the Blackbirders were outside with their guns and their dogs. There was no escape. A dry wind came up as the night began to fall. The creaking of the moving branches was magnified by the tree and the men trembled at the terrible language it spoke in the darkness. Tomorrow they would be taken to Derby jail then far away to places they had never seen or heard of …amongst people from another world. But tonight they had to spend their last time together, crammed in the Larrkardiy’s womb as it whispered its ancient dreamtime language. This is one of the few times I am using someone else’s photo as the feature photo for a post as I do not have one of my own. Friday Fiction with Ronovan Writes is a challenge to write a piece of fiction using a photo prompt and I recognised this as an infamous tree from Western Australia’s past. This story is imagined but based on fact relating to this specific tree which is known as the “Prison Tree” and can be found near Derby in the Kimberly region of Western Australia. You can visit the tree which is allegedly over a thousand years old. Some boabs are considered especially sacred and are known as Malaji, possessing awesome power. This is one of these trees. Desecration of the tree is considered especially dangerous and if it was misused as a prison the aboriginals would have been terrified at the possible retribution the tree would bring upon them. The empty seed-pods can be used for storage, and also carved for ceremonial purposes. The history of this tree is fascinating, I read about it before writing my piece! I’ve enjoyed your haiku too! I’ve been doing this fiction challemge since Ron started it! Hope you get a chance to check mine out too! Absolutely! I used to write lots as a youngster then life, bit he and wife, and motherhood got in the way! I though I’d lost it, then started blogging, and with a little encouragement, that little burning ember of creativeness was lit again once more, and I love taking part in these challenges, they push you in directions you may not have thought to go otherwise! Many thanks for the very kind write up and the inspiring prompt. Looking forward to the next one!